Still on Whidbey, still at The Star Store and back to the deli like a weirdo. Possible they are worried I’m carrying a bomb as I’m spending way too much time doing laps though the isles, taking note of all the products I’ve never seen before. “Is she homeless?… But she’s paying for the food…” they might whisper. This recipe is from their deli. 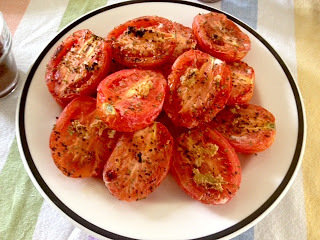 After trying the roasted tomatoes (wonderful! 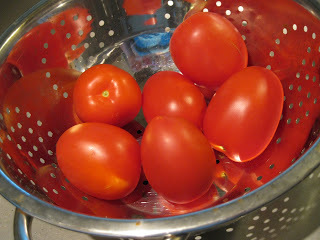 ), I went into the kitchen upon returning to Seattle, inspired to make them at home. The only difference is that I think they used herbs de provence and I used fresh oregano. Foodie Note: We are buying a CSA-style produce box from our friend Leah-the-Barista. One day she mentioned that her boyfriend had gone overboard on their vegetable garden and she had more then two people could handle. “Eddie and I can probably help with this,” I said. Monday morning Eddie picked up a box full of farm fresh veggies (plus a dozen eggs!). 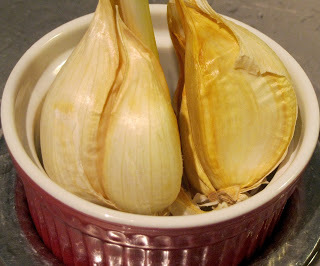 One of the many gems we got was a great long stock of Elephant Garlic, which can grow to the size of a new-borns head! Our stock was smaller, but the cloves are quite large. The taste isn’t as strong as the typical clove and it’s actually a little sweeter. Don’t be afraid to use the whole thing. Preheat oven to 400*F. Brush a baking dish with olive oil. 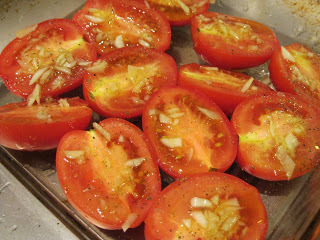 Place tomatoes cut-side-up in dish, season with salt and pepper. 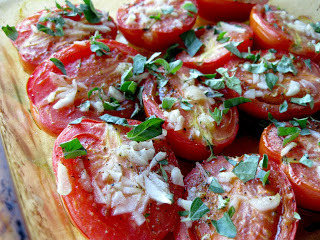 In a small bowl, mix olive oil and garlic, brush onto tomatoes. Bake for 10 minutes in top third of oven; bump up temperature to 450* and bake on same rack for 10 more minutes. Sprinkle with fresh oregano and serve. Foodie Note: So good the next day! I reheated in a skillet and had a egg with them… just amazing. This is a versatile menu item. Props to my dear friend, Erin Galloway, author of erin-sometimesifeelcrafty.blogspot.com. She brought these babies to a bridal shower and looked “like a culinary heinous”. Get it girl! Check out her blog, it’s wearable creativity with a side of sass. I knew I was friends with her for a reason. 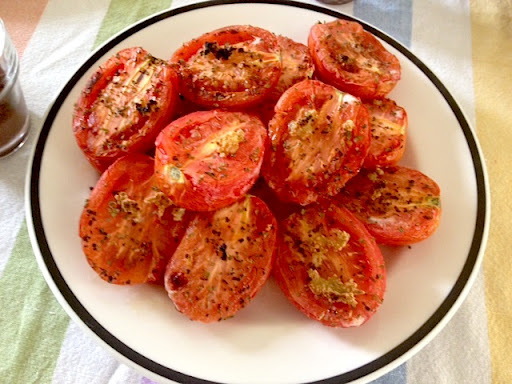 Erin’s Herbed Roma Tomatoes… those do look pretty good. And then I learned how to proof read. I looked like a genius…genius. Hilarious… Thought it was a word I didn't know. Should have looked it up! May I say they were delicious. My mom always used to make a version of these growing up…also super tasty with some fresh parmesan sprinkled on top! Honestly, can Parmesan ruin anything? I think no. that looks amazing. might be giving this a try over the weekend….! I highly suggest you do! Summer tomatoes are on the verge of sublime.